Since the spark of international trade in the late 19th century, Ulysse Nardin has been crafting marine chronometers, keeping captains and their valued cargo precisely on course. Advanced since its first introduction, the UN-118 caliber is powering the artfully designed Marine Chronometer Manufacture Only Watch. Gracing the 43 mm diameter case is its beautifully handcrafted enamel dial produced by Donzé Cadrans, the world-recognized enamel-dial specialist and a member of the Ulysse Nardin group of companies. A refined and complex decorative technique, the mastery of enamelling depends upon both the personal sensitivity and daily practice of the artist. It is a centuries-old craft that continues to make its stunning mark on Ulysse Nardin timepieces. For the Marine Chronometer Manufacture Only Watch dial, the aesthetic is a bright, snow white offset by black Roman numerals and bold accents of cherry red, presenting a style that is simultaneously straight-forward and interesting. Its 18-karat rose-gold bevelled case enhances the timepiece’s sophistication. Further illustrating Ulysse Nardin’s imagination in watch making is the UN-118 caliber, the manufacture’s self-winding base caliber conceived and executed entirely in-house. This caliber continues the advancement of Ulysse Nardin’s use of new materials and techniques. The anchor escapement in Caliber UN-118 is produced using DiamonSil, Ulysse Nardin's revolutionary alliance of diamond and silicon, and a furthering of its pioneering collaboration with Sigatec. Caliber UN-118 demonstrates the synergies between technologies of the engraving of silicon and Diamond Coated Silicon (DCS) and is the first member of a new family of movements that will house this anchor escapement in DiamonSil, with Ulysse Nardin's own oscillator and its patented hairspring. The movement features a stellar 60-hour power reserve indicator, oversized small seconds register and a date display at 6 o’clock. 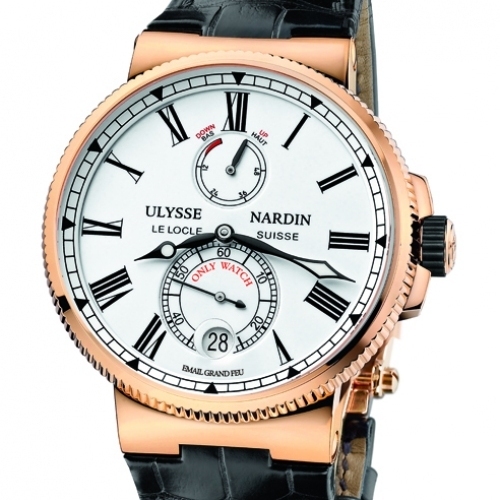 It boasts Ulysse Nardin's "quick setting" allowing forward and backward date adjustments. The Marine Chronometer Manufacture Only Watch is offered in 18-karat rose gold with a black leather strap. From the art of enamelling to the precision of engineering and technology, Ulysse Nardin reveals that art and innovation go hand in hand in leading the company in the most independent of ways.